Travertine terrace formations at Pamukkale. Pamukkale's terraces are made of travertine, a sedimentary rock deposited by water from the hot springs. The underground volcanic activity which causes the hot springs also forced carbon dioxide into a cave, which was called the Plutonium, which here means "place of the god Pluto". This cave was used for religious purposes by priests of Cybele, who found ways to appear immune to the suffocating gas. The hotels built in the 1960s were demolished as they were draining the thermal waters into their swimming pools and caused damage to the terraces. The water supply to the hotels is restricted in an effort to preserve the overall site and to allow deposits to regenerate. Access to the terraces is not allowed and visitors are asked to follow the pathway. Huanglong Scenic and Historic Interest Area, A similar UNESCO world heritage travertine cascade in China. ^ Scheffel, Richard L.; Wernet, Susan J., eds. (1980). Natural Wonders of the World. United States of America: Reader's Digest Association, Inc. p. 286. ISBN 978-0-89577-087-5. ^ a b c Scheffel, Richard L.; Wernet, Susan J., eds. (1980). Natural Wonders of the World. United States of America: Reader's Digest Association, Inc. p. 286. ISBN 978-0-89577-087-5. ^ "Hierapolis-Pamukkale World Heritage Site". UNESCO World Heritage Centre. Retrieved 2007-06-23. ^ "Pamukkale Turkey Hotel And Hostel Redesigned". PRLog. 2009-01-10. Retrieved 2009-09-02. ^ "Dolok Tinggi Raja - Wikipedia bahasa Indonesia, ensiklopedia bebas". 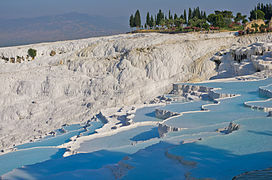 Wikimedia Commons has media related to Pamukkale.